A few days ago, Allen & Heath unveiled a new Xone 4+1-channel DJ mixer. At Musikmesse, they introduce the same model with built-in audio interface. 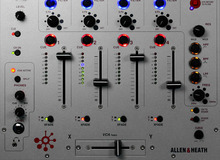 Allen & Heath announces the availability of the new Xone:43 4+1 channel mixer for DJ. Australian company Grav Corp has launched on KickStarter a compact 4-channel stereo mixer that does not require any power supply nor battery. Rane introduces this week at NAMM 2015 a new mixing console for DJ that can handle analog and digital sources. Reloop will introduce tomorrow at NAMM 2015 a new digital mixer for DJs, the RMX-60.